SDC 2018 SR1 includes support for the delivery of MyEclipse 2018 (now based on Photon). SDC 2018 includes an awesome new feature that makes it easy to set up the workspace and share the settings with the rest of the team — all in one click. Also, the help documentation has a new layout presentation. In addition, SDC 2018 includes a number of feature improvements and bug fixes. With SDC, we are always looking for ways to make the setup of IDE environments as simple as possible. This release brings a feature based on Oomph, for any Eclipse 4.6.2 or later. It will help to configure preferences, repositories, projects, working sets and perspectives either by a simple click selection or while importing resources from git. In the case of preferences, they can be configured by modifying them or accessing a preferences page. It will be fun to set up IDE environments. Workspace Sharing is built on top of Oomph. 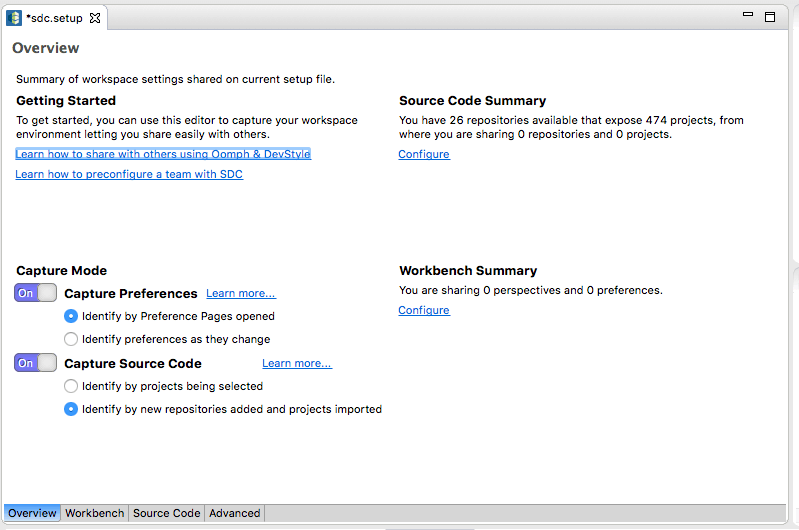 While SDC doesn’t support all Oomph features (e.g., Eclipse package provisioning or software install), you can use most of the workspace configuration features, and you’ll find our editor very easy to use for these cases. Other than that, you can drop .setup files inside your Admin Console and promote your package to get your end users to benefit from this feature. SDC 2017 SR 1 now offers more delivery options, including delivery of our Webclipse and Darkest Dark plugins as well as our Angular IDE. You’ll also see improvements in Java Runtime management. This release is based on Neon 2 and includes a number of in-product improvements along with various improvements to the Admin Console. We are pleased to announce that SDC now allows secure delivery of the Darkest Dark and Webclipse plugins, as well as Angular IDE from the delivery hub. 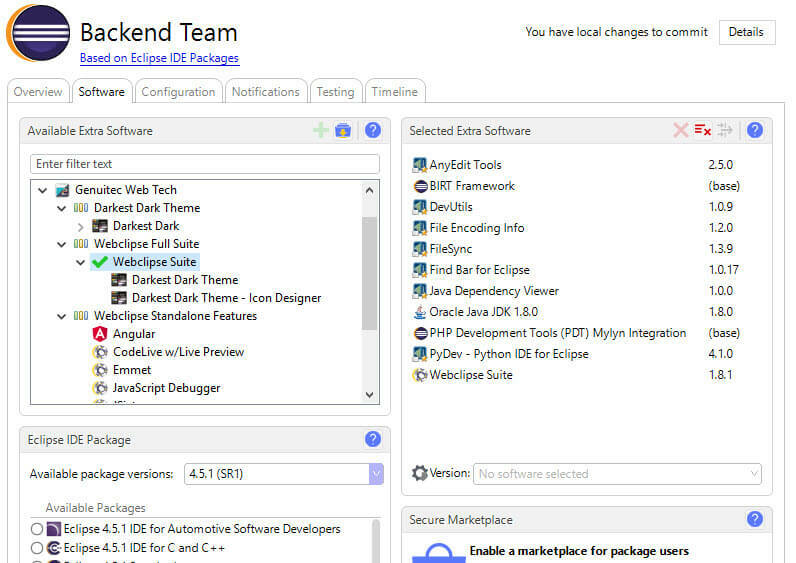 Add Webclipse to your existing Eclipse packages to provide numerous improvements for your teams! Improvements on Java Runtime configuration for uninstallers and installed packages — SDC 2017 SR 1 has significant improvements for Java runtime detection and configuration. In particular, with Neon’s requirement on Java 1.8, the installer flows are improved to ensure correct configuration and execution of the IDE. If you have an issue with an older release the installer repair flow is your friend. Now you can specify if a JRE can get downloaded if the system does not have one to run the installer, supported on Linux and Windows. We have upgraded the base of SDC to Neon 2 to take advantage of a greater Eclipse base. Admin Console now has web font icons, giving a fresh look and feel. Added a Remember me option to the Admin Console, with the ability to log out from it. Our portal now supports Internet Explorer 11 without compatibility mode. Better reporting when using “Get Packs”. 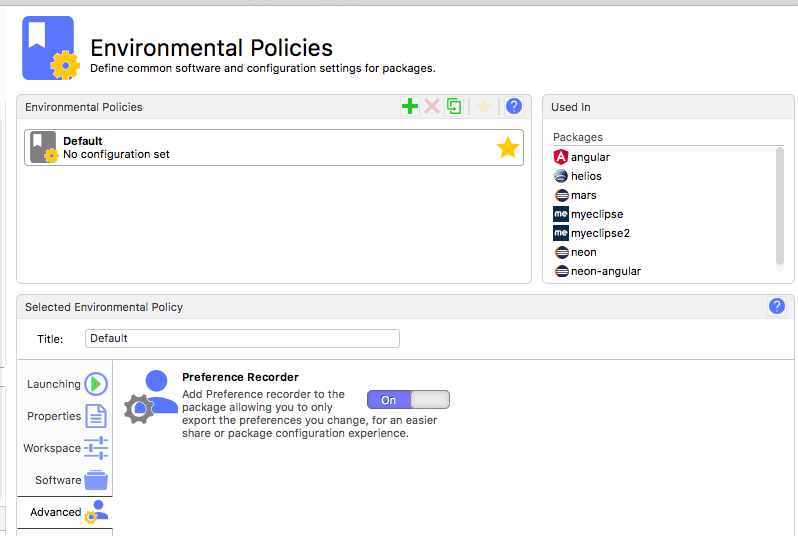 Added a Preference Recorder, you can select this setting inside the Environmental Policy. Improvements over the “Update from base components” setting inside the Advanced Tab of the security policy, better behavior while trying to perform a bundled software. Fixes an issue on how the Dependency graph is calculated to allow upgrade of base components, making this feature less error prone. In-product fixes to support https proxies, from Helios to Neon. All the SDC artifacts are now signed with SHA1 to maintain compatibility with older JREs. SDC 2017 is based on Neon and has many exciting updates. The web portal has an updated look and allows you to make basic edits to packages without the need for the admin console. The admin console also has a new look and allows you to apply this improved flat design to your installers if you choose. Also included in this release: new options for handling invalid SSL certificates, support for HiDPI in the Admin Console, Linux Dark Theme and improved support for installed JRE configurations. SDC 2017 is now based on Eclipse Neon. All installers will now require Java 1.8 to run. The web portal has been updated with a modern look and feel and now includes basic package editing capabilities along with a handy text search that supports wildcards. There are also a number of usage metrics you can view as a system administrator or a user with portal access rights and you can optionally allow public access to package metrics. See Administering Packages from the Web Portal for more information. Note: If you prefer not to use the new portal, we allow you to switch to the old portal. See Switching to the Legacy Portal for more information. The Admin Console has a new and improved flat design. 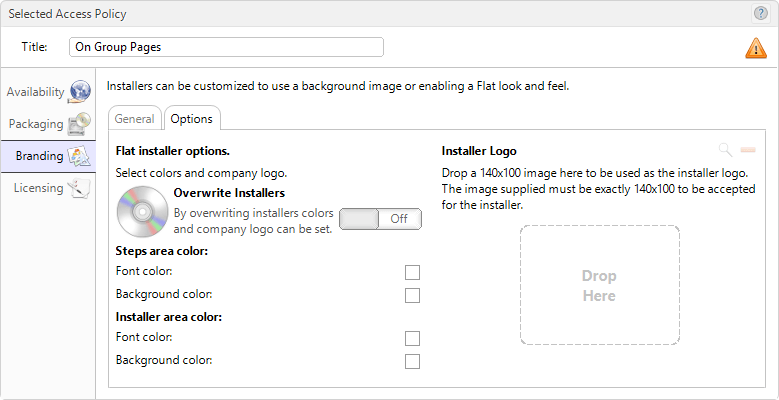 You can also choose to use this new flat design for your installers by updating the branding for an access policy. 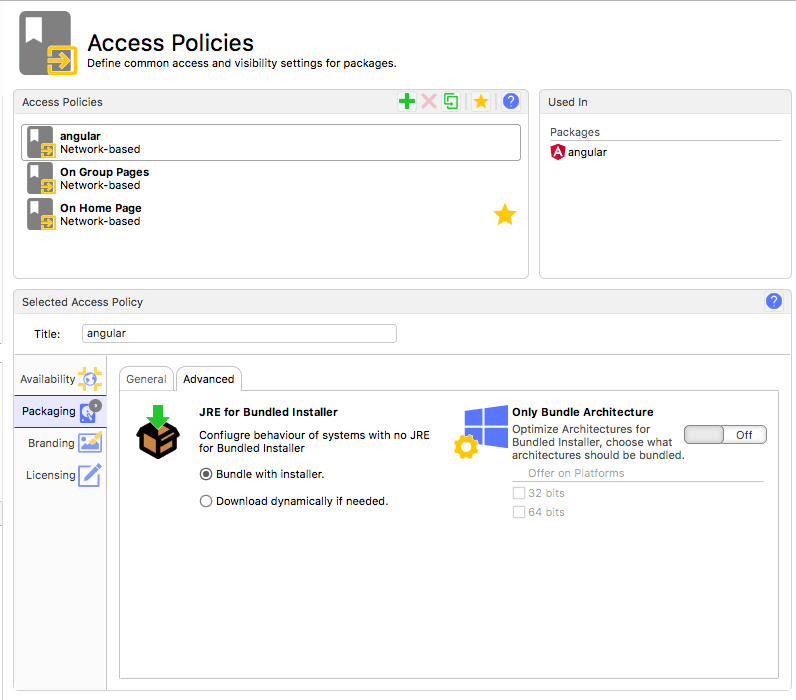 See Configuring an Access Policy for more information on customizing the appearance of your installer. If you attempt to access a third party or proxy with an invalid SSL certificate, a window displays listing the invalid certificates and giving you the option to continue. SDC 2015 SR4 includes the ability to select specific operating systems for software being delivered, includes support for the delivery of MyEclipse 2016 (now based on Mars!) and includes various bug fixes. 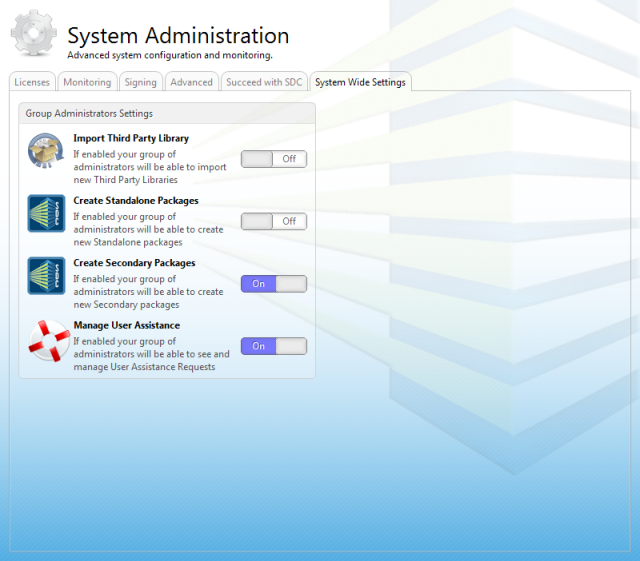 You can now select the operating system for the software included in your package definition inside the admin console. Select the software from the Selected Extra Software section and click to select the supported operating systems for the software. By default, all operating systems are selected. 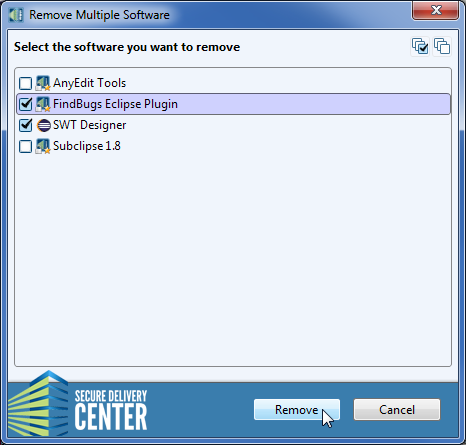 MyEclipse released a major upgrade based on Mars and this release of SDC includes the required changes to support MyEclipse 2016. 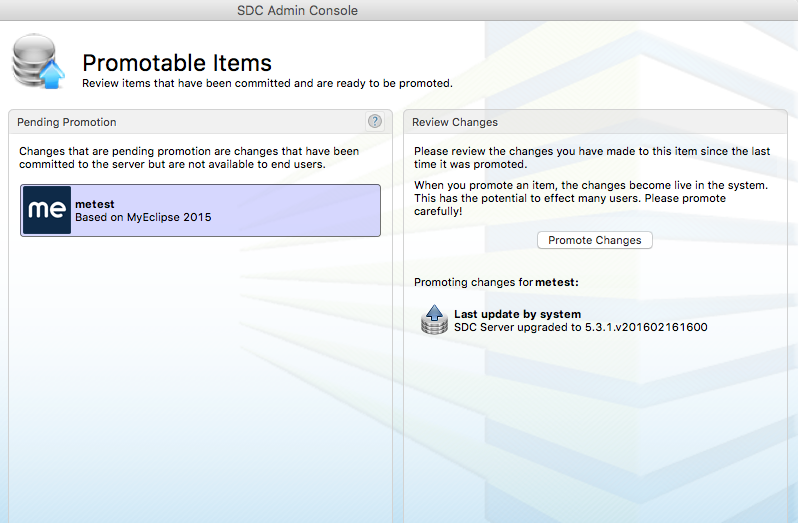 Before upgrading an existing MyEclipse 2015 package to MyEclipse 2016 be sure that all team members upgrade to SDC SR4. 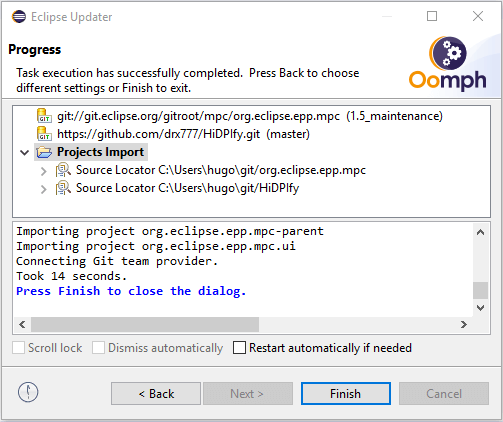 To do this, promote your MyEclipse packages before upgrading them to MyEclipse 2016 and have your team apply this update before you roll out an upgrade to MyEclipse 2016. Changed how the gathering of SDC Success program data is processed, reducing the CPU used. Better filter detection for Third-Party libraries. Fixed how Info.plist is generated for Eclipse packages and how the cache gets cleaned. Allows import of large Third-Party libraries, more than 2GB. You asked, and we listened! SDC 2015 SR3 is jam packed with stability and usability fixes. We’ve focused on making SDC provisioning more stable while at the same time giving Administrators more control. If you’re new to SDC or a seasoned veteran, you can download it today! You can now group ALL of the features you import from an update site under one Software so that it’s easy to use a large number of features from a site in your package. Additionally, extension locations can now be imported via the Import Third-Party Update Site wizard. Simply give a file:// URL to the directory and SDC will do the rest. More and more customers are using team packages to support their ever growing development teams. We’ve improved the team package support to make it more stable and user friendly. Now there is even less friction when supporting and on-ramping large teams! Hot on the tail of the last release, SDC 2015 SR2 brings you Eclipse Mars (4.5.0) support! Along with support for the new version of Eclipse, we’ve also packed this release full of bug fixes. Once again, we have bundled up the Eclipse discovery site for you to be able to consume with ease. Simply upgrade to SDC 2015 SR2 and install the pack using the Get Packs feature in your Admin Console. The Eclipse developers have been working hard to bring you an updated Mac OS X application format so that your Eclipse & Eclipse RCP applications look even more like a native OS X application. SDC fully supports this new format, however Eclipse’s underlying update support does not handle in-product updates from older versions of Eclipse to 4.5.0 and higher. Please read our Mac OS X & Eclipse Mars technical note for more details. We’ve added the ability to control the list of disabled plugins in JetBrains packages. Simply use the Export configuration for SDC… action in your SDC provisioned JetBrains install to create export the extra settings zip. Then drop that zip into the configuration area of your package and SDC will ensure that your disabled plugins list is well maintained. 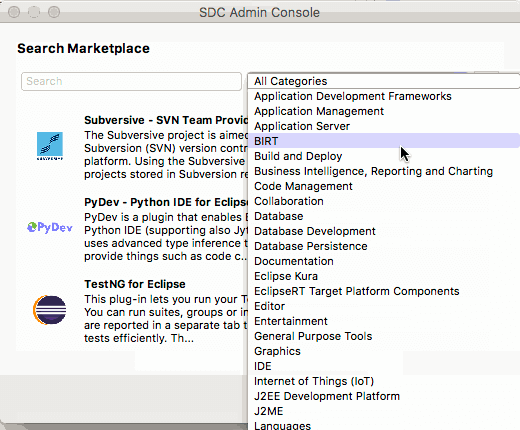 The SDC 2015 SR1 release adds a pilot feature – JetBrains IDE delivery. 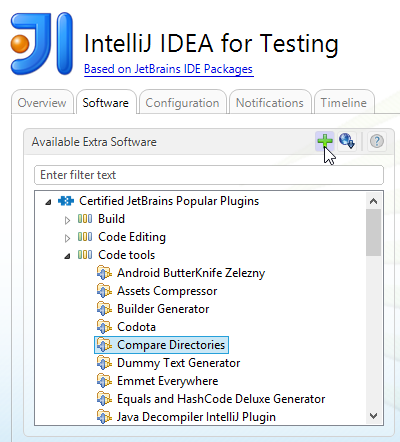 Organizations using JetBrains IDEs can benefit from the same team tool stack management technology that has simplified Eclipse delivery over the past several years. This feature is currently available for individuals or organizations included in the private beta program. Visit www.genuitec.com/go/jetbrains/ to join. Install an IntelliJ IDEA or WebStorm pack, and create packages tailored with add-on software, workspace tasks, and access policy settings. The private beta program allows you to promote IntelliJ IDEA or WebStorm packs to deliver to end users. 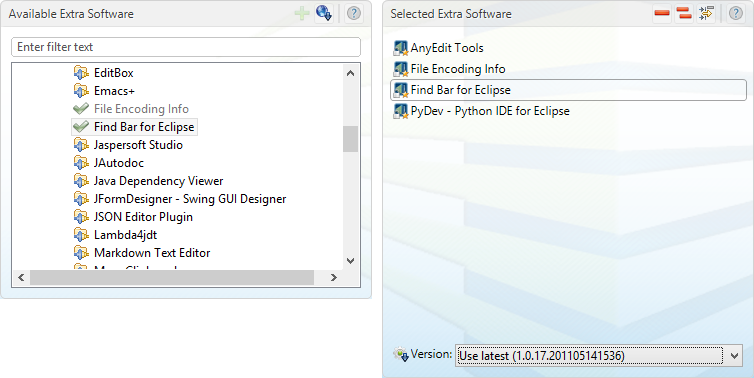 Note that some configurations used for Eclipse packages do not apply to JetBrains IDE packages. See the JetBrains delivery documentation for more details. For adding software to your JetBrains IDE packages, install the Certified JetBrains Popular Pack. The pack gives you access to add-on software specific to IntelliJ IDEA and WebStorm IDEs. The SDC 2015 release centers around the OSX 10.10 Yosemite update. 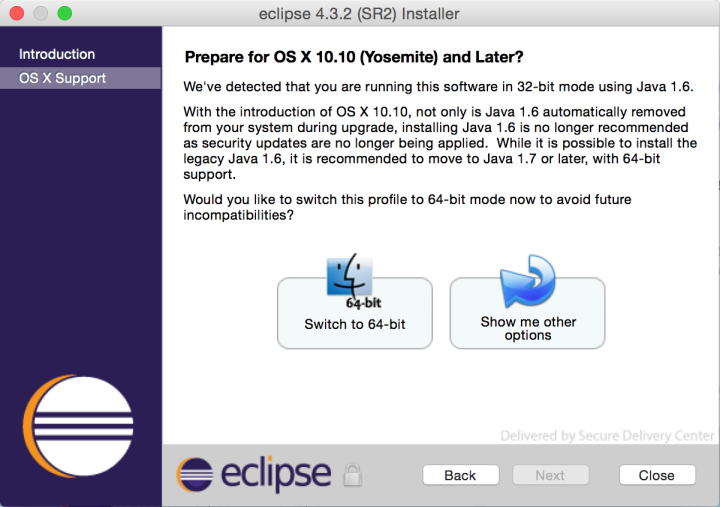 With the Yosemite update favoring only 64-bit software, SDC has made sure all installers and uninstallers are Yosemite friendly, and has made a simplified path for making sure your Eclipse and MyEclipse users are not stuck with a broken IDE. For more details on how SDC helps with your transition to OS X 10.10, see Smoothing the Transition to Yosemite. Once the SDC 2015 delivery hub is installed, your updated package installers are able to detect when a user has a 32-bit Eclipse installed and will provide an option to migrate to 64-bit automatically. SDC will also detect if a user’s system is missing a required version of the JVM. These helpful features will ease your transition to Yosemite. A new feature set added in SDC 2014 SR1 allows central administrators to delegate team software configuration responsibilities to team leads. The Advanced Team Delegation features of Secure Delivery Center let central admins maintain control over enterprise-wide IDE standards, while at the same time giving team leads the power to customize team stacks for their specific needs. Advanced Team Delegation offers a balance between enforced IDE standardization and team package flexibility. Central admins can keep standards in place by maintaining a common parent package with critical configurations. From there, customizable child packages are created for teams. Updates to parent packages flow down to the associated child packages without jeopardizing team customizations. Team customization can be maintained by team leads who are designated as Group Admins. Because of this new flow, packages are now designated as either Standalone, Principal, or Secondary packages. 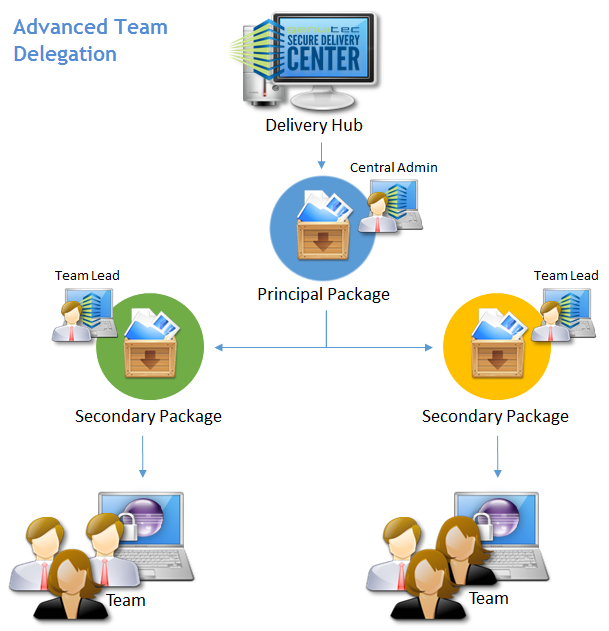 Standalone package – A standalone package is not used for team delegation purposes. A standalone package is equivalent to what has simply been known as a package up to this point. Principal package – A principal package is a basic package created for team delegation purposes. The central administrator creates a package with critical security policies, common software, and other overarching settings and designates it as a principal package. A principal package is the basis of secondary packages. Secondary package – Secondary packages are based on and linked to a principal package. They are customized and managed by team leads or admins. A Delegation policy is associated with a Principal package and indicates the level of control allowed to team leads (group admins) when customizing secondary packages. 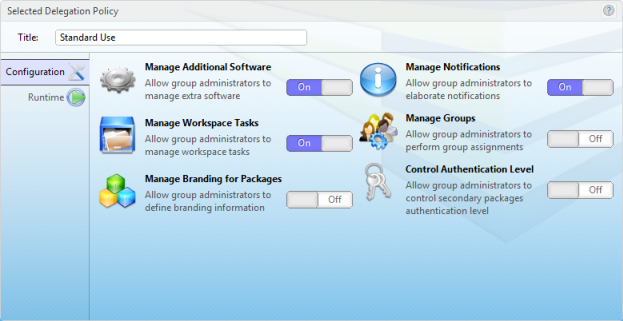 Group Administrators Settings on the Global Settings tab give group admins access to broader tasks that are system wide. These include access to third-party library installation, the ability to create standalone and secondary packages, and access to managing user assistance requests. The most important aspect of the SDC 2014 release is that it is ready to deliver Eclipse 4.4 (Luna). 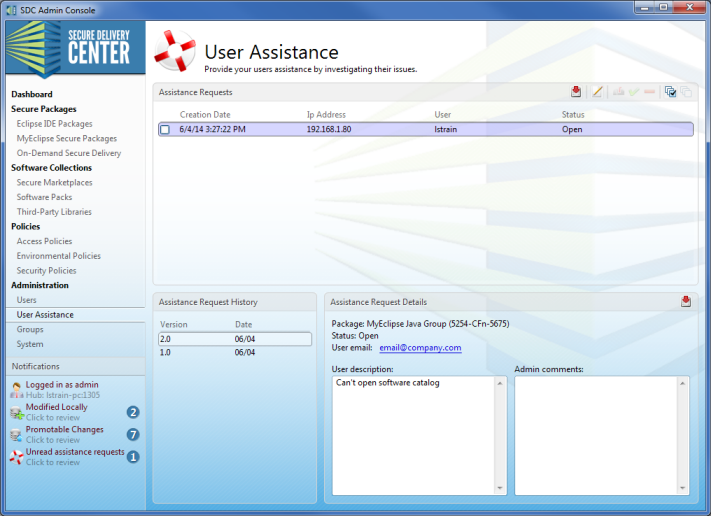 A new User Assistance feature has also been included, giving admins a system for helping end users with troubleshooting package issues. 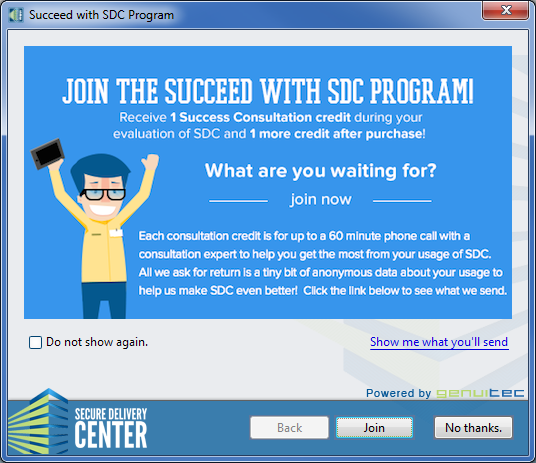 Read on to learn about the Succeed with SDC program and additional helpful features. Eclipse 4.4, the Luna release, landed on June 25th. SDC was ready for Luna delivery on day zero! Get Eclipse Luna and learn about Luna features athttps://www.genuitec.com/luna/. 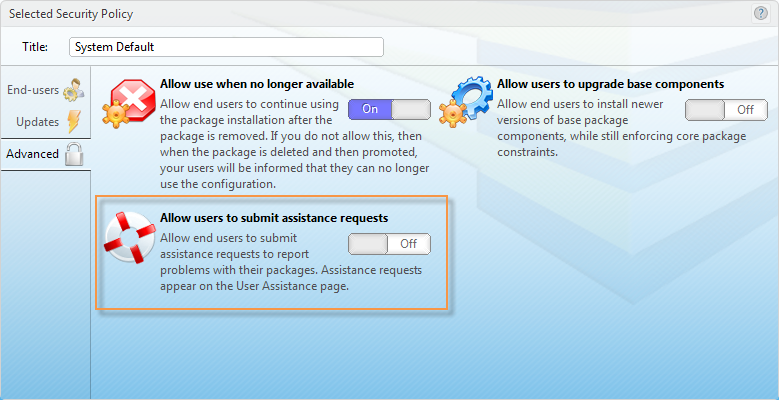 To better respond to help requests, you can enable the User Assistance feature in the security policy for packages. 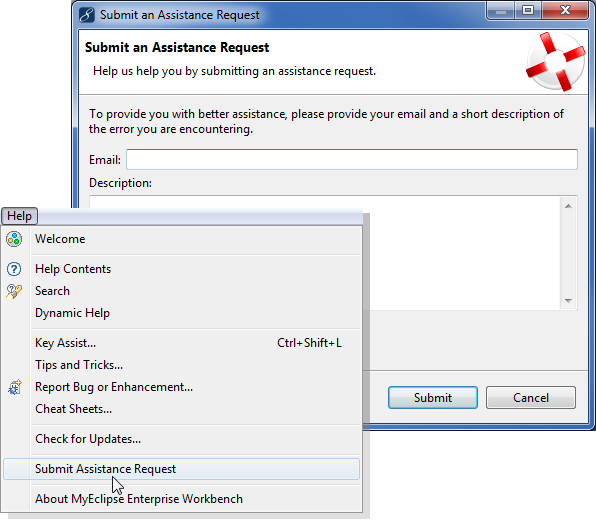 With this option enabled, end users can submit an assistance request from the Help menu if they experience issues with installing software, workspace updates, or other package-related issues. The user enters an email address and a description of the problem, and a request bundle is submitted to the SDC delivery hub. Whether you’re evaluating Secure Delivery Center or you’ve already recognized how SDC can meet your software delivery needs, we want you to have a successful experience. Genuitec offers the Succeed with SDC program that provides you with help to get up and going with SDC. By joining the Succeed with SDC opt-in program, you receive a credit for a Success Consultation during evaluation and a second credit on purchase. * Each Success Consultation credit entitles you to a 60-minute phone call with a consultation expert who will help you get the most from SDC. *Customers purchasing SDC after May 11, 2014 will receive Success Consultation credits based on the size of license purchased. Existing customers can opt in to receive a free Success Consultation credit. You can now include custom copyright and End-User License Agreement information. 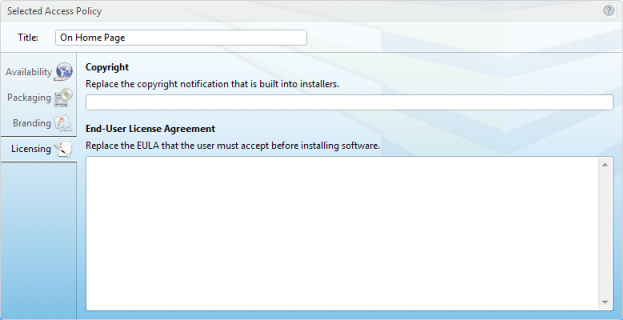 The copyright and EULA information will appear in installers for packages that use the access policies in which the information is provided. When setting the visibility of notifications to end users, some notifications might be needed only once, and others might need to be seen for each workspace in which a user works. 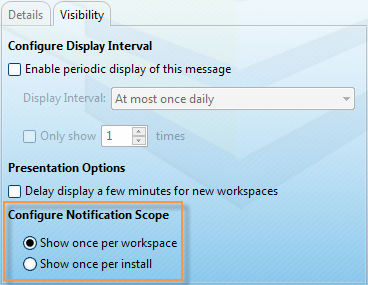 You can now specify if the notification should display once per workspace or only once per install. If you need to clean up add-on software included in a package or an Environmental policy, you now have an option to select multiple and remove all at once. The Selected Extra Software area includes a Remove Multiple icon , which opens a window that allows you to select multiple add-ons to remove. SDC 2013 SR4 includes two new features. The method for obtaining and installing software packs has improved, and new support has been added for architecture-specific arguments in Environmental policies. Getting updated software packs is now much more streamlined – no more downloading and running installer files manually! 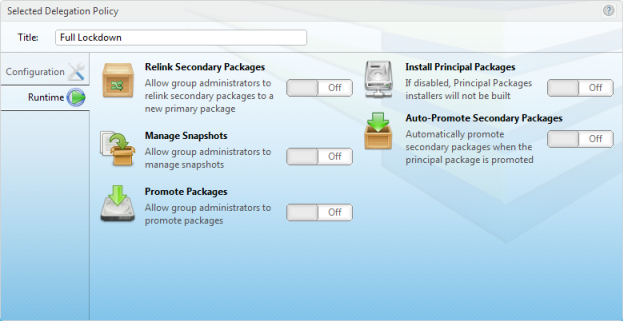 You can easily access and install packs from the Admin Console. 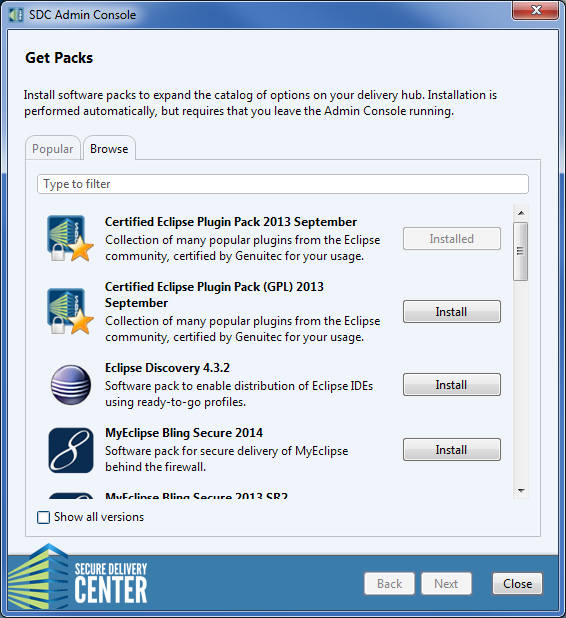 Use either the installing packs link on the dashboard, or the Get Packs button found on any Secure Packages or Software Collections page. 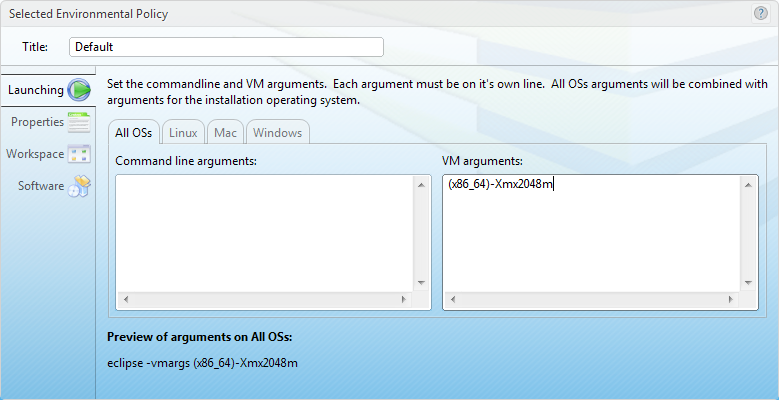 Either access method opens the Get Packs window so you can add more software to your SDC deployment. With this mechanism, you aren’t required to have administrator access to your SDC delivery hub machine to install new software packs. Simply click to install directly into the SDC delivery hub! 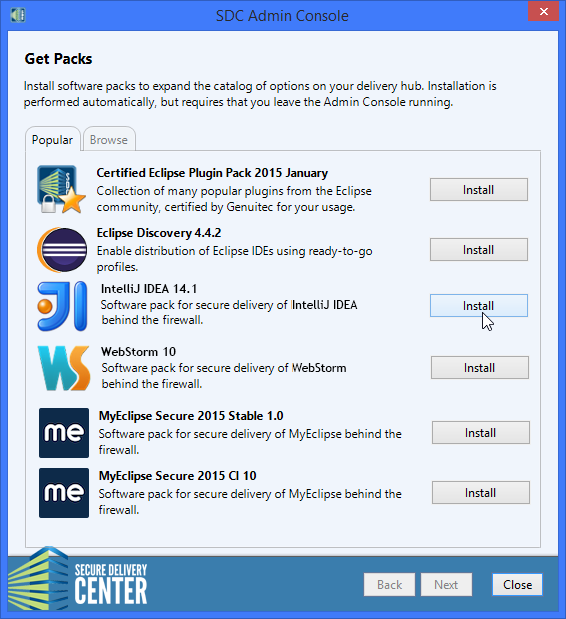 Click the Install button to install a new software pack. Items already installed are indicated with a disabled Installed button. If you don’t already have a license for a pack, you are automatically given a trial of the product. You can now include architecture-specific arguments in Environmental policies. 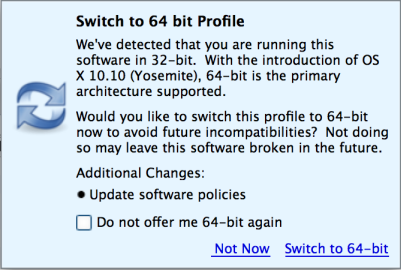 Adding an argument prefix of (x86) or (x86_64) allows you to target installations on 32-bit or 64-bit architectures, respectively.